I’m baaaack….and this time with some more frugal stuff. *Didn’t go on a big grocery run. I didn’t absolutely need much, so I grabbed a few fill-in items to get us through until this week. *My neighbor gifted us with a giant bag of pretzel goldfish packs she had bought for her kids and they didn’t like. Mine happen to like them, so they have been put into lunch boxes. 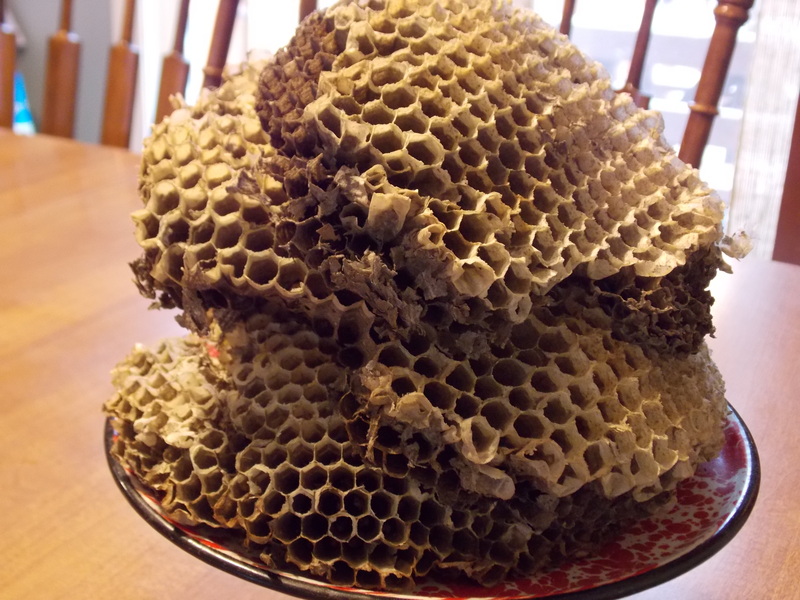 *I sold a couple of things on Ebay, including this wasp/hornet nest I found on the ground while walking one day. No worries–it is empty of any flying beasties. This may qualify as the weirdest item I’ve ever sold on there for sure! *I redeemed a $10 gift card I found to a local store that is actually closing this week. I used it to purchase another gift for someone else for free. 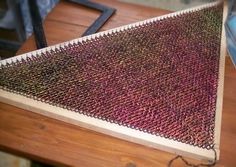 *Started making a crochet rag rug from some fabric pieces I likely won’t use. If it turns out decent perhaps I will do a tutorial on it here one day. Well, those are some highlights I thought of. Hope you have a wonderful week! If you know me in real life, you may have picked up on the fact that I like to live fairly frugally. I don’t think I was always this way, but as our family grew, I have learned to run this house in a frugal and practical way. Sure, I think we live modestly as far as the “big things” are concerned–we both drive older vehicles, our house is not big and fancy, etc, etc. However, I like to think that saving and living simply with the “small things” do add up in the long run. I am very inspired by other people who make things work by raising families on a modest income and LOVE to hear the little ways they save. So, in turn, hopefully I can perhaps inspire you in some small way by sharing what I do on a weekly basis to save us some cash. 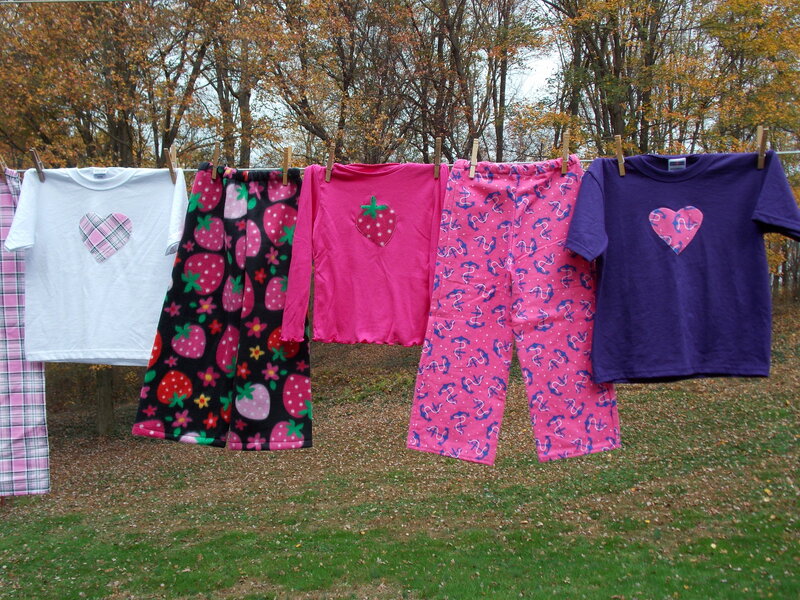 *With some nice sunny days I was able to line dry many loads of laundry and not run our dryer. *I sold a few items on Ebay. An old Michael Jordan jersey, which I found in a bag of free-to-us boy clothes, brought way more than I expected. Sweet!! *I went to a couple of yard sales on Friday. I scored a pair of kid snow pants for next year, a dressy shirt for Andrew, and a hooded sweatshirt for Heidi for a couple bucks. I also got a pair of knitting needles and some vintage quilt squares for free. I was just asking what the price was and the lady very much insisted that I just take them! *Though it wasn’t directly for my own kids, I was able to easily alter a couple dresses for my brother’s girls so they can wear them this summer. *Instead of doing a store run, I hit up my closet “gift stash” to provide a birthday gift for a party my daughter attended. *We watched a few things on Netflix. 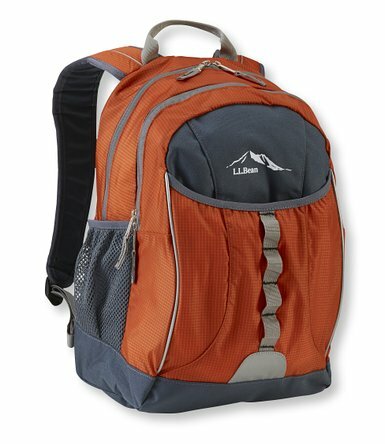 *With some coupon dollars, I was able to save a whopping $20 on a new backpack for my latest birthday boy. We have always bought LL Bean brand packs and they hold up for MANY years. He has had the same one all through elementary school and is now in 6th grade. This is the one he picked out–here’s to hoping it lasts through the next 6 years!! *We planted part of our garden on Saturday. That day we did 3 types of potatoes, green beans, and a little bit of sweet corn. Peas, onions, and a couple of other things had already been planted. *I cut some early spring flowers from our beds outside the house and used them for decoration inside. There’s just something about fresh flowers! Well, that was a sampling of some of the things I do. Stay tuned for more! Happy April! Thank the LORD we may actually have Spring within our sights now. Here is a second installment of a little series I call “What I’m Into,” where I divulge what either me or my family members are currently into. I am one of those rare people who enjoy coffee AND teas. Recently I discovered this wonderfully strong blend of Chai tea and loved it. I never thought I liked Chai, but apparently I had only experienced the wimpy kind until now. My baby girl is turning 10 next month! We let our kids have a special party at 1, 5, 10, and 16, so we are planning a cute little party for her and some friends and family. 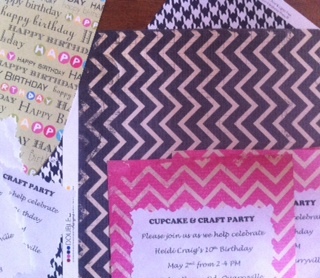 This is a pic of some invites I threw together today. 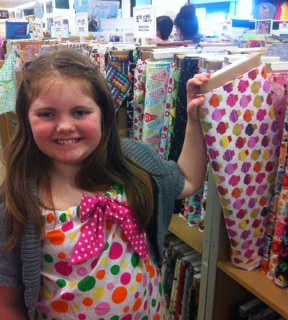 This is a shot of my girl in the fabric store, picking out a cute cupcake fabric for her party’s goody bags. 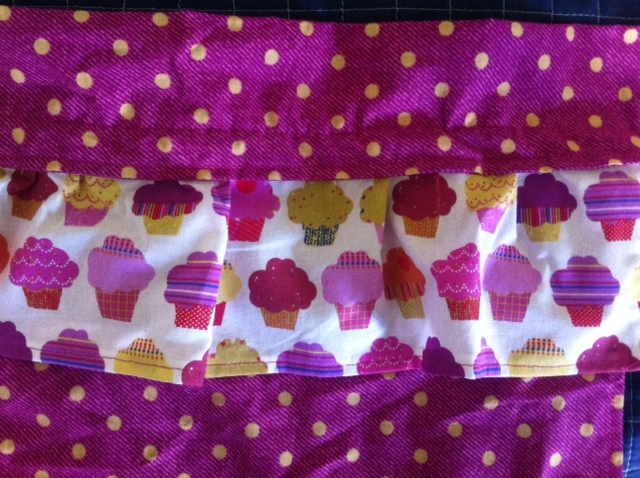 We love us some fabric. Like mother, like daughter. It’s a little frightening!! 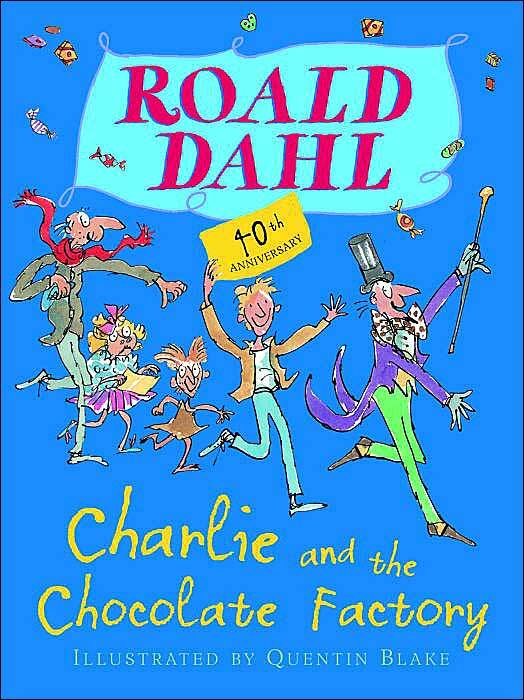 Though we have read this book aloud before, I am reading it again to the crew when we can before bed. I love the fact that though they are all pretty strong readers, they still enjoy being read to. Yeah, I didn’t either until a couple weeks ago when my sister-in-law discovered triangle loom weaving. She and her husband (my husband’s brother) made a couple of triangle looms and I inherited one that they made! What a nice surprise! Since then I have learned to actually use it and enjoy it. Once you get the hang of it it’s rather relaxing and easy to do. I didn’t take a picture of my actual calendar, but this is the time of year where it’s looking a bit ugly and full. A little too full for my liking. I feel as if every school event, field trip, concert, play, birthday, and any other activity we are even remotely involved in is crammed between April and the beginning of June. Lots of extra stuff going on right now and it makes my head hurt a little. Though we had a terribly rough winter in many ways, none of us had been physically sick at all. That is, until 2 weeks ago when 6 out of 7 had a stomach bug. Then we had a week’s reprieve. Now it has came back for a second round. Ginger ale and crackers are a staple here at the moment. With warmer weather starting to creep in, we took our first hike of the season the other day. It was glorious! Looking forward to many more this year. (FYI–no one was sick at the moment in this pic, though my one that’s not smiling got sick that night.) Also, this was taken at the bottom of a pretty steep hill. It may have been amusing to see an “after” shot of everyone once we dug in and made it to the top. Probably not such a cute picture at that point, haha. Right now I am loving song from Brandon Heath called “No Turning Back.” If you haven’t heard it yet, go ahead and give it a listen! This Easter season I was once again reminded of what Jesus did for me on that cross. Our church had a “Stations of the Cross” on Good Friday, which our family participated in. Near the end there was a picture on a screen of Christ on the cross. One of my twins stared at it with a troubled look on his face. I asked him what was up. He whispered, “But Mom, He didn’t do anything wrong to deserve that punishment.” No He didn’t, but He went through it anyway because of His great love for us.